Most of my best friends have two legs and furry bodies. One or two are German or Norwegian hairless. My good friend, Master Chef Klecko (Dan McGleno, or “Danny,” as one of our corner market store clerks calls him), wrote an incredible book on baking for man’s best friend, titled K-9 Nation Biscuit Book: Baking for your Best Friend. I don’t know if my good friend ever will know how touched I was by the devotion and words he wrote. Writing a book is a monstrous thing. I know—I have been in this territory twice. My last book I liken to giving birth to Pumpkin Head (I love horror films). I remember a couple of months ago, Klecko and I had coffee at Kopplin’s Coffee Shop in St. Paul. He commented on how isolated the process of writing is—how alone he felt. But what came out of that isolated time was an amazing book dedicated to his best friends…not Chad and me, but Peanut, Gracie, Romeo, Meatball, and Chili Davis—his pooches. I’ve met Klecko’s friends. Often, I am writing in my house in Highland Park, and he walks by with his little guys. He doesn’t knock at my door. Rather, he calls out from the sidewalk: “John Michael!” or “John Michael, come out to play!” We only live a couple of blocks from each other. My favorite pooch is Klecko’s petite Chihuahua named Meatball. He’s got little man syndrome. He’s a tough little guy with a lot of attitude. He tries to take on every dog in the neighborhood. Our next-door neighbor has a gentle and wonderful pug named Moses. Meatball challenges him every time they stop by. Moses just wants to make friends, but Meatball wants to claim territory. I think that Meatball is James Cagney reincarnated. Klecko writes that Meatball’s favorite recipe is Meatball’s PBJ Biscuit. It’s filled with strawberry jelly and peanut butter. Plus, my good friend adds Orange Flower Water that he purchases at Penzey’s Spices or at Golden Fig Fine Foods in St. Paul. I remember working with Klecko at the Minnesota State Fair last year, where he was baking madeleines. He told me that he was using Orange Flower Water. The next thing I noticed, he was using this wonderful exotic ingredient for dog biscuits. My good friend has been baking professionally for more than 30 years. He’s CEO of Saint Agnes Baking Company in St. Paul. It produces bakery goods for restaurants, caterers, and companies throughout Minneapolis and St. Paul. Klecko also is founder of the Saint Paul Bread Club, featured in Kim Ode’s book Baking with the Saint Paul Bread Club. If baking dog biscuits isn’t your thing, Saint Agnes Baking Company sells dog biscuits ($3.50 per bag, or three bags for $10.00) in its bakery, 644 Olive Street, St. Paul, the first Saturday of the month, 10 AM-Noon—phone (651) 290-7633. One chapter that will delight, if not assist, readers in becoming an expert dog biscuit baker is “Sources and Resources for Biscuit Bakers.” Klecko was thinking not only of the pooches out there, but also their owners. He has made it extremely easy to find the ingredients. He writes about co-ops as great resources for the ingredients you will need for his recipes. Listing flours and grains, he gives readers definitions of what they are, and what is in them. He cites ingredients from health food stores that will make your biscuits for your pooch not only tasty, but also healthy. He offers tips with many of these recipes, especially if they are challenging. Some of the chapters in this wonderful and useful (if you’re a dog owner) book include: “Honey’s No-Honey Miso Biscuits”; “Calm Down Biscuits”; “Tender-Tummy Biscuits”; “Bad Breath Biscuits”; and “Blue Ribbon Biscuits.” Those are just a sampling. By reading through each of these chapters, you will see this was a labor of love—a man’s love for man’s best friend. Klecko is very busy in animal aid organizations. I worked with him a couple of years ago for the animal charity Home for Life. He hosted the occasion. It was amazing to observe this man’s love for creatures, especially those most people would have given up on. He’s a fellow with a lot of talents, but what stands out is his love for animals. 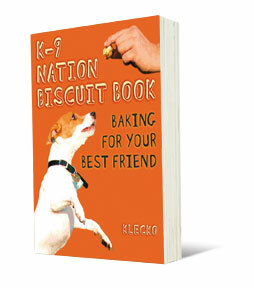 K-9 Nation Biscuit Book: Baking for your Best Friends is the best testament to that love. John Michael Lerma is a local chef, author, Food Network personality, and “lifestyle guru.” His company Garden County Cooking offers cookbooks, cooking classes, consulting, and private events, as well as culinary vacations to Italy and the Caribbean. Visit www.GardenCountyCooking.com. Check out his “Word of Mouth” Blog under Extras at LavenderMagazine.com.